In Part Two of our Series on Reflections on the Girls in Action Program, Alexus Emory '15 outlines the role of Girls in Action in her life. Do you ever think about who you are as a person? Well with the help of Girls in Action you can find out who you are. Girls in Action is a program that empowers young girls by teaching things they need to know in life. In Girls in Action I learned three main things that help me know and become the lady that I am today. The first thing I learned my birth rights. It helped me realize who I am. The second thing I learned is the rules of personal power. It helps me control my anger. The third thing I learned in Girls in Action is adders and Subtracters. Learning about adders and Subtracters help me realize who was adding to my life and who was subtracting from my life. Girls in Action help me know and become who I am. The first thing I learned in Girls in Action was my birth rights. Those rights are I’m loveable, powerful, valuable, and important. Outside of school those steps help me remember who I am as a person. One day ma couple of my family and I were talking about everything. Then one of them said, “Alexus, who are you?” I did not know what to say because I barely knew myself, until I came to Girls in Action. They help me know and remember who I am as a person. Inside of school it helps me to keeping powerful, by ignoring and not arguing with Subtracters or people because I know I’m better than that. It also helps me mentally. By knowing my values I know have more choices. Also since I know I’m powerful, loveable, valuable, and important I learned that my job does not define, make, or breaks me. Now that I know my rights I can talk and act like a lady who knows her rights. The second thing I’ve learned in Girls in Action is the “rules of personal power.” The first rule of personal power is you are born with power. The second rule of personal power is no one is more powerful than you. 98 percent of people will need help from the government or family by the age of 62. The only thing that makes the difference is you. The third rule of personal power is no one can take away your power, but you can give it away. The forth rule of personal power is power multiplies power. I use these rules to help me in and outside of school with control my anger. My anger has improved a lot. I do not get mad as much because I’m giving them the power when I get mad. Also I’m trying new thing to meet more and powerful people in the life, so my power can multiply. I also learned that your job does not make you powerful even through it makes you feel that way. Knowing the rules of power helps me try new things and control my anger. The third thing I learned in Girls in Action is that there are adders and Subtracters. Adders are people who add to your life, and Subtracters are people who subtract from your life. By knowing what adders and Subtracters are I have come to realize who was adding and subtracting from my life. Also it helped me not pressure someone to do something they don’t want to do. That is going to make me a Subtracter, and I don’t want to be a Subtracters. I want to be an adder I want people to say I touched them in a good way. It also helped me make new adder friends that help me stay forced in school, and this year I made the honor roll for the first time. Knowing what adders and Subtracter are helped and continues to help me surround myself around people who are adders. The three things I learned in Girls in Action have helped me out a lot in life. I learned about my birth rights, personal power, and adders and Subtracters. These things impacted my life so much that I personally believe that they can change the world, just by teaching these three things, so imagine what else they have in stored. I also believe that they are already slowly changing the world now by changing the teen girls’ life in Henry, Edison, North and the other schools that have this program. Those teen girls are changing the minds and lives of the young adolescence that are not exposed to Girls in Action, and those young adolescence are changing the minds and lives of others, and slow they are changing the world. If we put a Girls in Action in more school students can understand and know who they are and change the world faster for our future generation of girls. Over all Girls in Action is a life changing empowering program fit for girls from different walks of life. 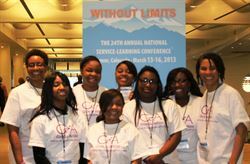 Upon their return to Henry, Char and Alexus will present to the GIA girls at their schools about their lessons learned from the conference. Accompanying Char and Alexus at the Conference were four other students from North and Edison are Ms. Natalie Johnson Lee - Director of GIA for Minneapolis Schools, and Dr. Verna Cornelia Price, Founder/Executive Director of GIA.